When most people buy eggs, they make their choice based on one key factor: price. Cheap eggs are good, expensive eggs are just sneaky marketing, end of story. You walk away feeling like you made the right choice, and are better off spending your hard earned dollars on something where quality really matters. Unfortunately, you’d be sadly mistaken. You see, not all eggs are created equal. And determining which egg is best when you next take a stroll by those mysterious cartons could make all the difference between buying one of nature’s greatest superfoods and buying a sorry excuse for a consumable. Here are five things to avoid, next time you buy eggs. Standard eggs are your run-of-the-mill el cheapo eggs. These are eggs cartons which don’t make any mention of “free-range,” “cage-free,” “organic,” “pastured” or otherwise. The cheapest eggs are laid by hens that are shoved into tiny cages that are stacked one atop the other, like an awful high-rise. It’s fair to say that caged hens aren’t very happy. They have no room to move, no access to sunlight and the outdoors, no social interaction with other hens, and they’re fed artificial feed designed not to make them big and healthy, but to make them lay eggs faster. These are not healthy hens, and it means that their eggs aren’t healthy either. Standard eggs from caged hens are more inflammatory, have less beneficial nutrients and are more likely to trigger food allergies in certain people. A 2010 study clearly demonstrated this, showing that pastured eggs had twice as much vitamin E, two and a half times more omega-3 fatty acids, 50 percent less omega-6 fatty acids (the inflammatory kind) and 38 percent higher concentrations of vitamin A than eggs from caged hens. And that’s not even looking at the various other nutrients found in eggs. And if the lousy nutrient profile of standard, caged eggs doesn’t put you off them, this should: your conscience! 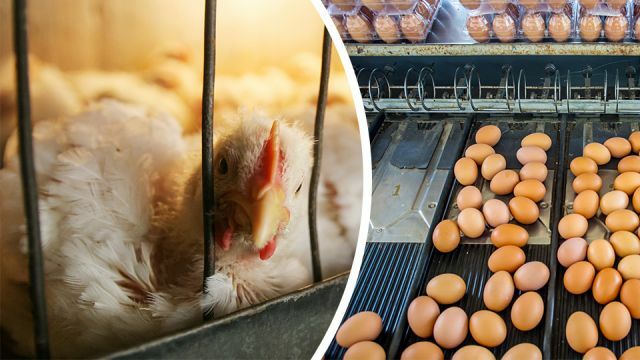 By buying cheap eggs, you’re supporting the inhumane treatment of chickens that deserve better. Like every other living thing, chickens deserve to roam under their own free will and to thrive on the foods and habitats of their choosing. Sticking them into cages isn’t exactly fulfilling that need. This one might seem like a no-brainer, but I’m constantly surprised to see just how many people buy eggs without actually opening the carton to check the eggs inside. More often than not, those people will get home only to find that at least one of those eggs is cracked and leaking, which means that it’s integrity has been compromised and it’s no longer safe to eat. A study done a while back estimated that cracked eggs are up to 93 times more likely to infect someone with salmonella than intact eggs. My trick? Open the carton and quickly run your index finger across all the eggs, giving each one a little wiggle. If the egg wiggles in it’s little hole without an issue, it’s usually fine. If it doesn’t wiggle and seems stuck, chances are it’s cracked and the interior has leaked out and stuck to the carton. I’ve often bought eggs that are covered in feathers and all manner of other detritus and thought nothing of it. The naturalist in me even used to get a little kick out of seeing feathers and such stuck to the eggs: proof they’re real eggs laid by real chickens! But eggs that are soiled have a higher risk of passing on pathogens like salmonella and E. coli. Sometimes when you crack these eggs, whatever little beasties were residing in the soiled outside of the eggs passed into the yolk and egg white, which if undercooked could mean those pathogens pass into your digestive tract. Not ideal. If you find yourself having unwittingly bought soiled eggs, give them a good wash under the tap before you crack them. Better yet, soak them in warm, soapy water then rinse them afterward. Okay, this is where things start to get a little confusing. Yes, you should avoid eggs from caged hens… but egg cartons labeled with “cage-free” aren’t actually much better. While “cage-free” means the hens that laid the eggs weren’t confined to cages, they were still confined. In these facilities, thousands of chickens are crammed into a fully enclosed, dark, smelly warehouse building or shed, with almost no room to move and ghastly unsanitary conditions. In many cases these “cage-free” hens are even unhappier than caged hens, as there’s intense competition for space and food amongst the horde of thousands. This means more stress for Henny Penny, and less happiness. Unhappy chickens lay nutrient-poor eggs, meaning you’re getting far less bang for your buck. This one is probably the most confusing of all… you thought free-range eggs were the healthy choice, right? I certainly used to, and the higher price of these eggs suggests that they are too. But these days, “free-range” doesn’t actually mean a whole lot. In the U.S., labeling eggs “free-range” legally requires the egg producer to provide some form of access to the outside world. Chicken farmers keen to make a buck can interpret this however they choose, and almost all of them choose to install the smallest door possible to provide that outside access and the smallest, dingiest “outdoor area” possible beyond that door. Do you really think the 5,000 hens cooped up in that shed are getting outside for eight hours a day, rummaging in the grass for insects and seeds, and having a merry old time of it? Most “free-range” chickens won’t ever see the light of day, and those that do may only see it for five or ten minutes and have no opportunity to forage for the foods they actually thrive on. This means that most free-range eggs aren’t really any better than cage-free eggs. When it comes to buying good eggs, you need to get your priorities straight. Is the health of you and your family important to you? Do you mind spending a few more dollars for each carton of eggs? Or maybe you can only afford one or two more dollars. Whatever your goals, there are plenty of ways to make your egg-buying experience a whole lot more nourishing. Pastured, organic eggs: these are the cream of the crop, laid by hens who are able to roam free, eat bugs and seeds supplemented by organic feed, and sleep in clean, comfortable coops. Pastured eggs: usually just as healthy, but without the organic certification. Organic eggs: these don’t guarantee as much free roaming as pastured eggs, but there are certain legal requirements to provide more space for these hens and you at least know that the feed is healthy and free of antibiotics and growth hormones. Free-range eggs with added omega-3: Chickens that don’t get to roam as much generally have lower beneficial fatty acid profiles. These hens get extra omega-3s in their diet, which improves the nutritional status of the eggs a little. Free-range eggs: okay, but not great. Cage-free eggs: pretty darn bad. Caged eggs: bad, pure and simple. Hey Buddy!, I found this information for you: "Before You Buy Eggs, Avoid These 5 Things". Here is the website link: https://www.thealternativedaily.com/before-you-buy-eggs-avoid-these-5-things/. Thank you.